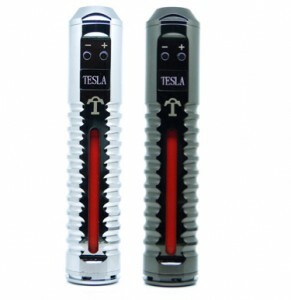 The Tesla Personal Vaporizer MOD is another heavy hitter among the many PV MODs available today. Being a very powerful MOD and using the 18650 battery, it is a rather large sized MOD but makes up with the solid performance it delivers. Unlike most generic LED displays used on PVs, the Tesla features an OLED display with scrolling text. Variable voltage and wattage and monitors everything with the microprocessor, giving you all the features expected on a high end MOD. Hands down, one of the best looking PVs we have seen. The Tesla paid attention to detail. Featuring a sophisticated on-board processor that controls temperature and settings to a minute decimal, a grip design handle and side vents to keep the battery cool, it is also easy to operate and a high performance unit at very low cost. Perfect for any beginner. 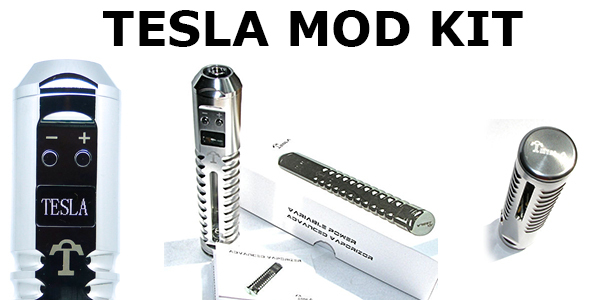 The body of the Tesla MOD is made of lightweight aluminum alloy and comes in black, chrome and black/chrome finish. Designed with fully rounded corners and a great grip design. One of the main things existing owners mention, is how comfortable it is to hold and free of sharp edges. It is well vented with three big vent ports on the side protecting from overheating and burning out batteries. The OLED display is also unique providing bright scrolling display that works well in daylight, but a down side is that the buttons are placed above in such a way, that you are usually covering the display with your thumb. It’s a bit of a pain but not a deal breaking flaw. 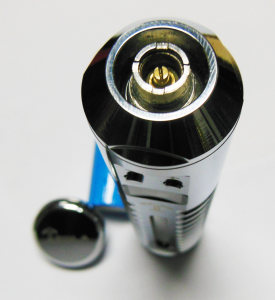 The design features a spring loaded, adjustable 510 cartomizer contact center pin that ensures your cartomizer center pin never gets pushed in and always makes contact. That alone is an excellent feature that all MODs should take note of. Smooth threading but can get squeaky due to being aluminum, but a little bit of lubricant oil can fix that. The Tesla MOD runs a PWM chip set to run on RMS for accurate readings and calibration. 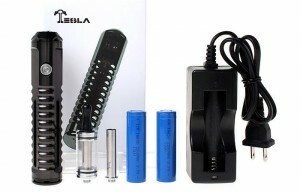 It features fully variable voltage and wattage. Voltage can be adjusted from 3.0 to 6.0 volts in 0.1 Volt increments and watts adjust between 3.0 to 15.0 in 0.5 Watt increments. It runs a solid 3 Amp circuit and up to 15 watts of power. Enough to variation to match any e-liquid flavor for optimal vapor but also balanced on low settings and a small monster on high settings. It runs on a single 18650 battery and is compatible with just about any atomizer above 1.2ohms, we suggest 1.3 and up to be exact for certainty that it will work. Depeding on where you purchase your Tesla, the battery is usually not included. Any 18650 2000+mAh battery will be plenty to last you for the whole day. The venting slots are really good design as it ensures you battery will never overheat, reducing lifespan or even causing failiure. The tank fittings are limited. The threading is 510 and eGo compatible but the compartment size is small making it incompatible with the larger sized tanks on the market. However we do know that many popular tanks do fit and operate very well with the Tesla MOD such as Smoktech UDCT tanks for a good fit and high performing results. There might also be a 510 adapter that can be used to raise the connection thread from the base chamber for bigger tanks to fit, but we have not tried. 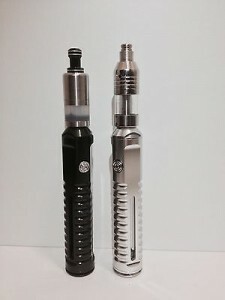 Additionally, big tanks usually require extension adapters and make the device bulkier and heavier, sometimes running the vapor too hot as well. With that said, there’s little concern about some of the big tanks being incompatible. The Tesla is not hard to use at all. The OLED screen is matched with (-) and (+) buttons but as mentioned, the quirky placement is sort of upside down covering the screen when you need to press buttons. It’s not a big deal and you quickly get used to it. It works similarly to single button PVs. By holding the (+) down for different amounts of time in seconds to bring up the different menus and variable settings. You can set the OLED screen to display any of the different readings such as the all important atomizer ohm resistance, volts and battery life. The screen scrolls text for easy reading and allowing more information to display vs the tradition digit LED screens, making it easier to understand from the get go. Very easy device for anyone. The Tesla is one of the lower prices devices on the market and can be purchased from various online licensed distributor shops, but being low cost, does not often include a battery or charger. For this model, we highly suggest you purchase from fasttech.com for the lowest online price along with a solid 6 month warranty on hardware. At only $46 and free shipping included, it is well worth the investment. The Tesla MOD does not disappoint. It offers all the important features without any special bells and whistles. Vapor production is very good and competes with the best. Vapor production is very good and competes with the best. The design sets conform center stage with no sharp edges, solid grip and good ventilation. It doesn’t offer anything out of the ordinary and is not the most powerful MOD you can buy, but for the very competitive cost of about $70, the Tesla MOD kit continues to grow in popularity.